Extrusion is one of the most common types of O-Ring failure. When the internal systemic pressure of an application becomes too great, the O-Ring will frequently extrude into the clearance gap between mating parts. In many instances, this extrudate will be nibbled away causing a loss of material, with seal failure quickly following. There are three options to prevent extrusion failure, the first of which is to tighten the clearances to reduce the extrusion gap. This can be a costly option; a less expensive solution is to increase the hardness of the O-Ring. Although a higher durometer O-Ring offers superior extrusion resistance, it is often not a feasible solution due to material availability. What’s more, harder durometer materials have limited low pressure sealability. The third and best option is the addition of a back-up ring, made from a hard, extrusion resistant material such as high durometer nitrile, nylon, Hytrel®, or PTFE. Back-up rings are designed to fit between the O-Ring and the extrusion gap, thus minimizing the probability of extrusion failure. While back-up rings are used in conjunction with O-Rings in both static and dynamic sealing applications, the gland they fit in must be specially designed to accomodate both the O-Ring and the back-up. For more information on gland design please visit All Seals's static or dynamic gland design guides. 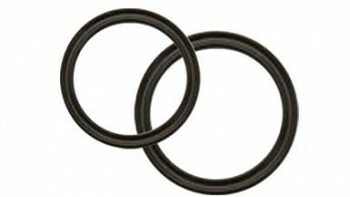 Contoured back-up rings are anti-extrusion devices used in both static and dynamic sealing environments.